The Jungfraujoch railway station, which at an elevation of 3,454 meters (11,332 ft) is the highest railway station in Europe. It is often called the "Top of Europe" in tourist literature. The Husband and I were keen to go up the Jungfrajoch but our plans were thwarted by poor weather. We stayed at Interlaken for 2 nights and the plan was to take the train up to Jungfrajoch on the first day, and then travel around Interlaken on the second. Strong winds on Day 1 meant that the trains weren't running. We ended up spending Day 1 at Interlaken and Thun. 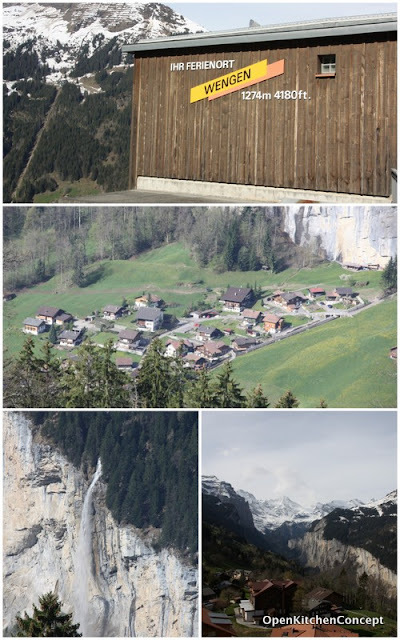 On Day 2, we were told that the trains were only running up to Wengen, a village part of the Jungfrauregion, located at 1274m above sea level. Since we didn't have any other plans, we decided to visit Wengen. It is a small, supposedly car free village alpine village and after a short walk round the village, we heard that the trains were running again up to Jungfrajoch. The weather wasn't too good that day, so although we heard that it is a waste to pay for the (rather overpriced) tickets up to Jungfrajoch because there isn't much to see, we went ahead anyway. It started snowing lightly as the train climbed up the mountains. The train was packed full of tourists who like us, refused to let the weather thwart their travel plans. Well, it turned out that we didn't get to see very much indeed - all snow and clouds that day but being from Singapore and Hong Kong, The Husband and I did have a very fun (and freezing) day at the Jungfrajoch train station, roaming around the ice palace and squeezing it out with the hundreds of other tourists. Supposedly with perfect weather conditions, one can see the Aletsch Glacier, the longest ice stream in the Alps clearly and even views stretching as far as France, Germany and Italy. Views on the way up..
We came down from the Jungfrajoch station via a different route, stopping by another alphine village, Grindelwald for a very late lunch. By then, both The Husband and I were starving so all I really did remember of Grindelwald was the tortilla that I had. If you have had an opportunity to visit Jungfrajoch in good weather, do share your photos with me! LOL... like a koala. But you are right to be careful. The snow is so magical! Yes, blessedhaven, the snow is amazing! my hubby & i were at jungfrau many yrs ago for our honeymoon. lucerne too. beautiful places huh?! if only we have such landscapes here. Can I check with you do I need to purchase the swiss pass and jungfrau rail ticket in advance? Where can I buy them? Is it better to buy when I get to swiss or buy in advance first? Hi James, the Swiss pass you should buy first, before you get there. I would only buy the Jungfrajoch pass there - I'm not sure you can buy it in advance and it's so weather dependent you might want to decide if you should go up only after understanding the weather.